The Charles Lafitte Foundation (CLF) has awarded a $10K grant to Puppies Behind Bars, to aid in both service dog and law enforcement training. Puppy raisers are carefully screened prior to being given a puppy to insure the puppy’s safety. The program trains prison inmates to care for puppies from the time they are 8 weeks old to approximately 2 years. During this time the inmates not only raise these puppies and become responsible for a life beyond their own while incarcerated, but they also train their puppies for law enforcement and to become service dogs for veterans who have been wounded. The program currently has 72 dogs in training and over 600 graduates. Over the last decade the need for law enforcement K9s has skyrocketed. The NYPD along with other law enforcement agencies have continuously worked with Puppies Behind Bars (PBB) to train explosive and drug detecting dogs who will work side by side with officers in efforts to make their cities a safer place for everyone. The law enforcement agencies and war veterans that use Puppies Behind Bars are not the only ones that benefit from the program. Prison inmates make excellent puppy raisers because of the unlimited time they are able to dedicate to their dogs. 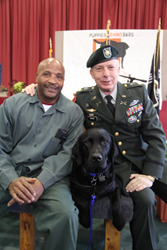 Through this program the inmates are taught responsibility, patience, and how to not only give, but also receive unconditional love; which all play a huge role in the prison rehabilitation process. “We are thrilled to continue funding Puppies Behind Bars in their efforts to support the compassion a puppy can bring to the lives of others," said Kyra Citron, Director of CLF Kid’s Corner. The Charles Lafitte Foundation has awarded grants to PBB since 2002, bringing the grand total to $45K in grants to the program. For more information on Puppies Behind Bars visit http://www.puppiesbehindbars.com/home . The Charles Lafitte Foundation (CLF) supports innovative and effective ways of helping people help themselves and others around them to achieve healthy, satisfying and enriched lives. The Foundation supports organizations working in four main areas: education, children’s advocacy, medical research & issues, and the arts. The Foundation underwrites programs that can become self-sustaining with long-term commitment and measurable impact. In determining grants, CLF looks for solutions that lead to independence and self-empowerment for individuals, and to the establishment of effective, long-standing programs and organizations. For more information about the Charles Lafitte Foundation visit http://www.charleslafitte.org.